Subsonic airfoils should be round in the front and sharp in the back. A century of visual reminders should make this obvious. However, I see it violated often with regard to after-market wings people install on their cars. The wings are already not very effective for the speeds that most cars are driven, but they are -really- ineffective when mounted backwards. Remember: put the round end upstream and the sharp end downstream. That's really the big rule at the core of standard airfoil setup. Everything else is just tweaking and optimization. For our purposes, all airfoil diagrams shown in this primer series assume air movement from left to right. 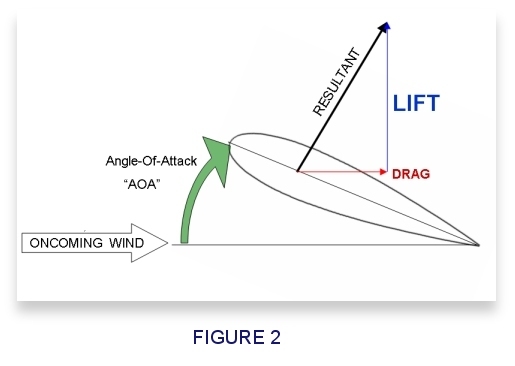 Take a symmetric airfoil and point it directly into the oncoming wind as shown in Figure 1. Since the airfoil is parallel with the wind, we can’t measure or feel any perpendicular forces (up or down in this case). The lift is zero. However, there is a slight tugging force from the friction of air dragging along the airfoil surface. We call this force drag.